Fleet Feet Columbia is partnering with MORE Foundation Group to support families in West Africa through shoe donations. Did you know that your old athletic shoes (running & soccer) can be turned into agricultural training, food-bearing plants, tree nurseries, and much more? 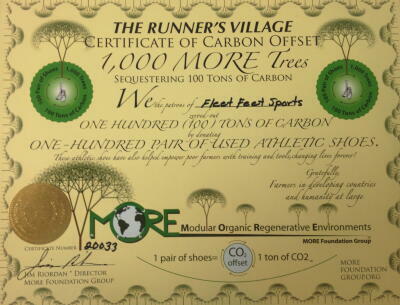 A single pair of used athletic shoes can also remove one ton of carbon from the atmosphere, while helping lift an entire family out of poverty. Those dusty shoes in your closet have more power than you know! How You Can Help: Bring in your used - but not abused - athletic shoes. The MORE Foundation needs athletic shoes (running and soccer, sizes 7 – 11.) It's time to change your shoes and change lives. Where to Put Your Shoes? Simply bring in your old, gently used athletic shoes to Fleet Feet Columbia, and let one of our staff members help you. Local Action with a Global Reach! Help Adopt a Family in the Runners Village: With 600 pairs of donated shoes, the MORE Foundation will adopt an African family on our behalf. The family will receive organic farming training as well as the tools and other essential resources to increase their productivity 1000% or more! We will receive a banner of gratitude from West Africa bearing the name of our adopted family and the name of our store. We will also receive a photograph of our adopted family holding the same banner!